Hi everyone! I have been sailing around the island of Spitsbergen the past few weeks in the archipelago of Svalbard, the land of the Polar Bears! When Tom brought me on board the MS Fram it was a little bit boring for me at first. Tom had a lot of meetings with the Expedition Team to talk about the upcoming Voyages and organize tasks. I stayed in the cabin the first day where I have my own bed and just sorted out my clothes and got my camera ready for the first days. There are about 170 passengers onboard this ship who paid quite a lot of money to join the Adventure. The big dream for everyone of course is to see the King of the Arctic: the Polar Bear! From the first day, I kept an eye on the shore line, knowing a bear could potentially show up anywhere. 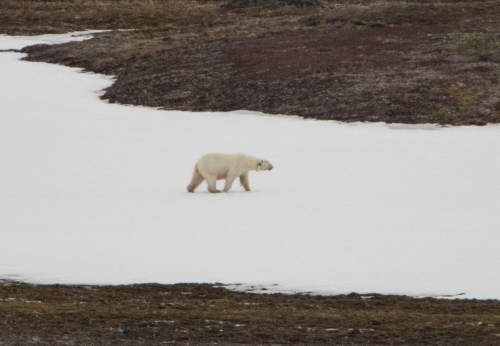 After a few days of sailing through the beautiful scenery, we still had not spotted a bear and I started to find it hard to believe the biggest bear of all lives in a landscapes a barren (but beautiful) as Svalbard. We sailed through long fjords and straits filled with ice, one piece white, the other one blue, yet another one completely transparent. There is something about sailing in this area that makes your soul feel at peace. I quickly felt lucky and blessed to be onboard the Fram here in the Arctic, where everyone likes me and takes my picture, and wants to follow my adventures on Facebook. It is always nice to be popular with the passengers especially when so many come from my home country Germany. One very early morning, we suddenly heard the voice of our Expedition Leader on the loudspeakers announcing the officers on the Bridge had spotted a Polar Bear! Tom jumped out of bed and put on the first clothes he could get his hands on, grabbed his cameras and lenses and other camera gear and rushed towards the door. I was just about to remind him of my presence when he turned around and stuffed me inside one of his pockets. I had no chance to grab my camera or my clothes so even though I couldn’t see anything from inside that pocket, I quickly felt we were going outside on deck, amongst the early morning winds of Spitsbergen like many of the other passengers as I could hear people running and shouting. Once Tom stopped running, I poked him in his thigh to tell him to get me out of his pocket so I could see the bear as well. At first, no one seemed to know wear it was and everyone was asking Tom to point the bear out, but he hadn’t spotted it yet either. After some directions from the officers on the Bridge, we finally saw the bear and the first thing I noticed about it was that it was very big! It was walking along the shore portably in search for food. 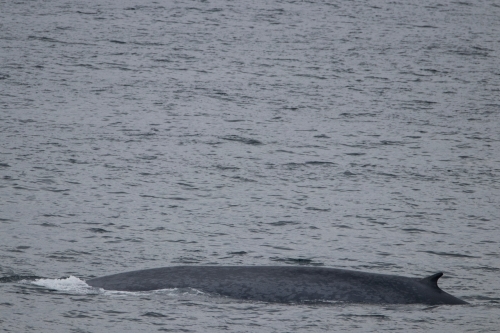 Everyone was amazed to see this creature in its natural habitat and we stayed close to it for about half an hour before sailing on. Not too long after the bear-day, we reached the Northernmost point of our journey at 81*35’ North in the midst of the pack ice where we also saw a walrus! The guests on board have been very happy with the landings the Expedition Team had organized and I am very impressed with the beauty of Spitsbergen. Tomorrow we start a new Expedition and I will try to update you all a little more often. Internet is almost non-existent here close to the Pole so I had to catch the right time. There might be a chance that Tom will take me out Kayaking amongst the Icebergs! I am really looking forward to that and the other Adventures that await me, Tom and the others here on MS Fram! Thank you for following and keep an eye out for my next posts!